As the keystone of Boston’s ambitious sixty-acre Government Center project, Boston City Hall represents an imaginative synthesis of cultural and political aspirations to renew the city under the mantle of the “New Boston.” This aspirational phrase represented a movement to overcome decades of decay in the city’s urban fabric, a steep decline in its tax base, and a toxic tradition of political corruption. As a key symbol of this movement, Boston City Hall was called upon to rejuvenate the urban core, restore confidence in the municipal political system, and kickstart a flagging economy. The design itself was commissioned through a nationwide competition that garnered 256 submissions. The jury included Pietro Belluschi, Walter Netsch, Ralph Rapson, William Wurster, and other civic leaders. They selected the scheme by then little-known Gerhard M. Kallmann, N. Michael McKinnell, and Edward F. Knowles, celebrating its “great monumentality, drama and unity” along with its ability to provide “a strong focus for the symbol of city government.” The jury’s announcement sparked a “dignified controversy,” with one newspaper headline asking if the design was “‘Delightful’ or ‘Way Out’?” Another queried if it was a filling station or a work of art. 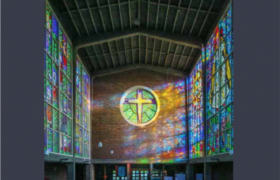 Opened to the public in 1969, the building was constructed faithfully according to the original competition scheme in order to signify that the project was free from political interference. The architects envisioned a structure carrying “subtexts of culture memory, history, and myth,” invoked through layered references to modern, classical, medieval, and ancient traditions. 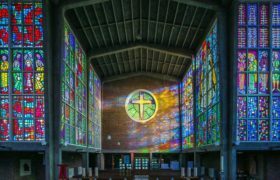 The scheme is arranged according to what the architects termed a tripartite classical order for its programmatic distribution. The lowest floors of the brick mound contain high-traffic public services. The top floors project outward with tiers of offices for the municipal bureaucracy expressed through smooth precast fins. In between is a zone defined by monumental cast-in-place columns with ceremonial spaces visualized through concrete “hoods”: the council chamber and offices, the mayor’s suite, and the municipal library. The south entrance hall forms a vast room rising upward through two dramatic light shafts, anchored by an enormous, amphitheater-like brick staircase that leads upward to the ceremonial chambers. Shortly after its opening, the building received widespread praise in newspapers and professional magazines across the globe. Wolf von Eckardt of the Washington Post called it “a great work of architecture… that proclaims the majesty of government by the people.” Ada Louise Huxtable of the New York Times described it as “a superior public building in an age that values cheapness over quality as a form of public virtue… [it is] one of the handsomest buildings around, and thus far, one of the least understood.” Huxtable hinted at what she termed the “architecture gap” between professional and public opinion—a fissure in the building’s reception that remains evident today. 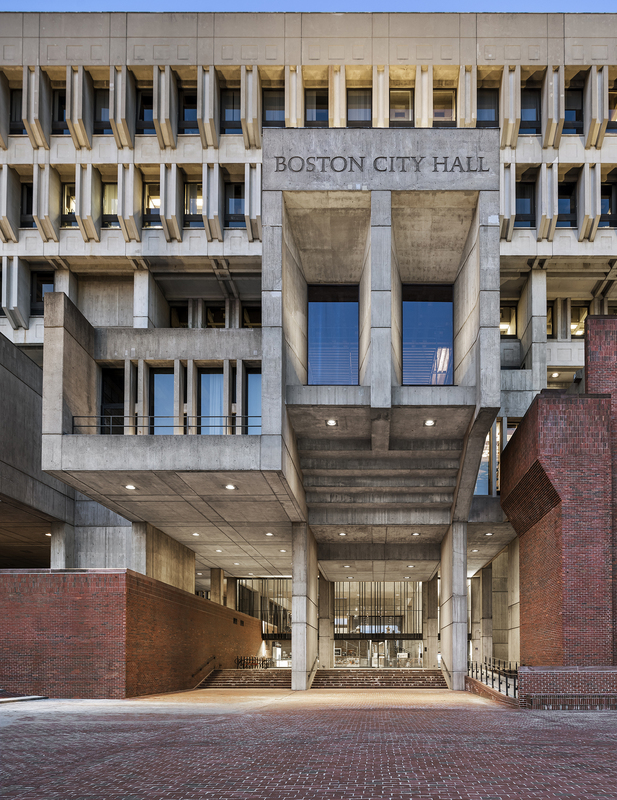 Despite opening to great public fanfare, Boston City Hall’s use has yet to fully embody its architects’ aspirations to “engage successive generations of the citizenry in the embellishment, decoration, and adornment of the robust armature” that they had designed. 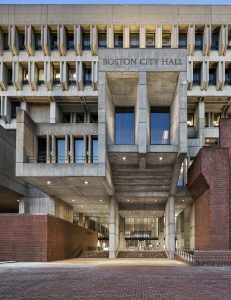 Years of neglect appear to be reversing under the current political leadership, which is examining the future of the building and its plaza, a generally unloved brick expanse developed under the Government Center plan. Launched under the direction of Mayor Martin J. Walsh, several pilot projects have included upgrades to exterior and interior lighting, the entrance lobby, and other public spaces, along with a master planning study (www.rethinkcityhall.org) for the building and plaza. This year, the city commissioned a conservation management plan funded in part by the Getty Foundation’s Keeping It Modern program, while architects and landscape architects are now beginning to develop designs that will improve the plaza and enrich this area of the city. 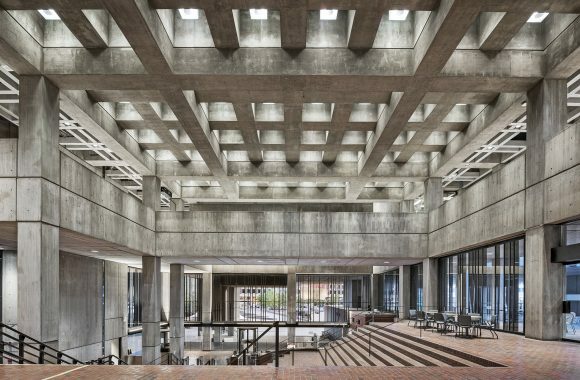 If Boston City Hall once initiated a “rebirth of confidence” in Boston, its renewal fifty years later could serve as a bellwether for changing public sentiment about concrete modernism as well as a model for future action. 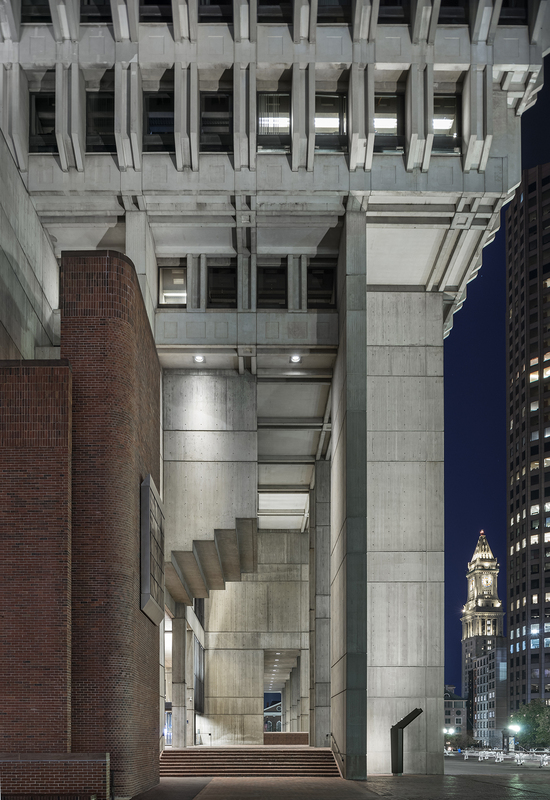 Mark Pasnik authored Heroic: Concrete Architecture and the New Boston (The Monacelli Press, 2015) with Michael Kubo and Chris Grimley. He is currently part of a team developing a conservation management plan for Boston City Hall. 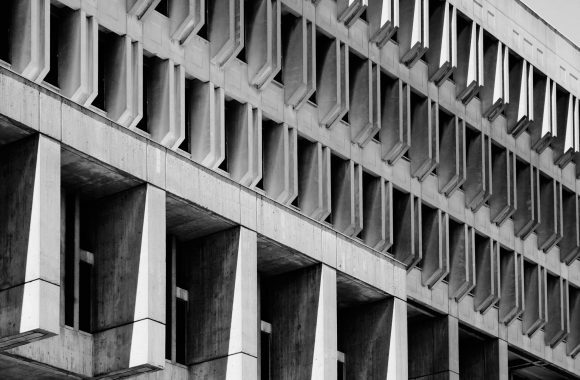 (Earlier versions of this text appear in SOS Brutalism and Heroic: Concrete Architecture and the New Boston).